One of the more amusing things about foraging is that you can covet a certain plant for years and years, but never find it. Then, when you finally do, you start to see it everywhere. This was the year I cracked the code on how to harvest hazelnuts, Corylus cornuta, in the wild. What makes harvesting wild hazels so hard? Glad you asked. I’ll tell you. 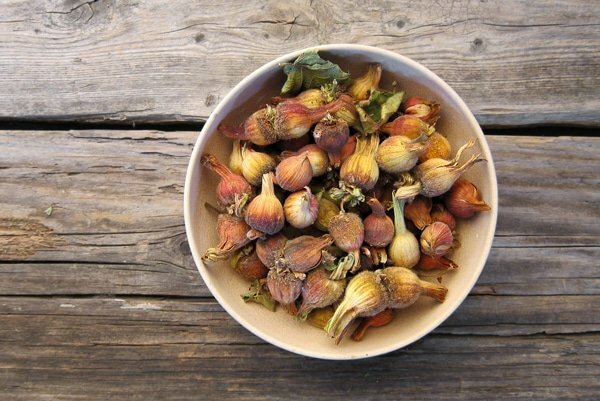 First, you don’t harvest hazelnuts in traditional nut season (read: autumn). Nope, hazelnuts come ripe in high summer here in California, or late summer in most other places. If you wait until late September, when most other nuts are ripening, you’re too late. I pick most of my hazels at the end of July and in early August. Which brings me to the second problem. Finding hazel trees. Lesson One: Hazelnuts don’t grow on trees. They grow on shrubs. Rarely will a hazel grow past 15 feet high, and eight feet or less is pretty much the rule here. So you don’t want to look up to spot hazels. In fact, you need to look down, or rather under. 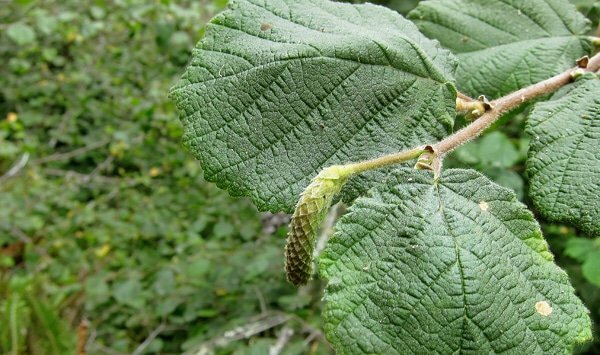 Hazels hide their nuts underneath their leaves, so harvesting them is a matter of moving around the branches and spotting the funny-looking beaky sheaths that enclose them. But I’m getting ahead of myself. First you need to know where you might find beaked hazelnuts. In California, you will find hazelnuts only in Northern and Central California, on the coast, the Sierra Nevada or in the Sisykous. 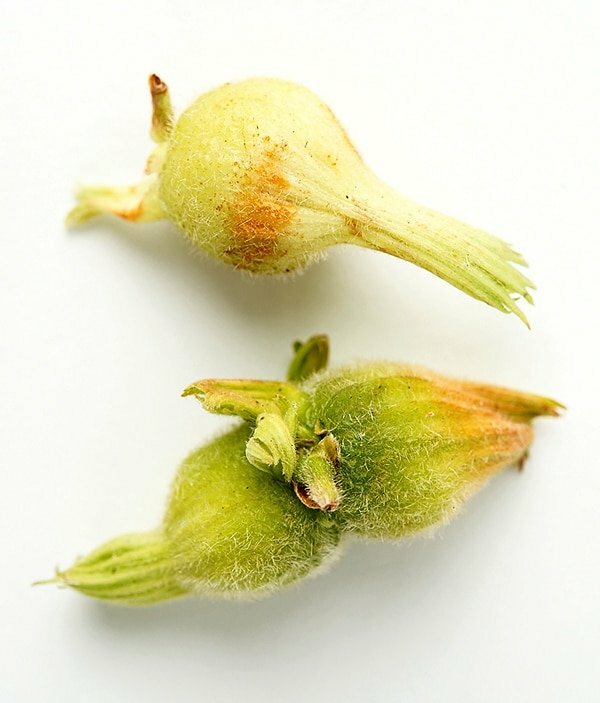 Beaked hazelnuts also can be found in western Washington and Oregon, in much of Canada, Minnesota, Wisconsin, northern Michigan, New York, all of New England and pretty much the entire Appalachian Mountain Range. Now you need to identify the plant. We’ve established that it’s a shrub. Hazels like to live kinda-sorta near moisture, but not right on riverbanks. I tend to see them near little streams and on roadsides. They also grow close to the shoreline on the Pacific Coast. They don’t look like much. 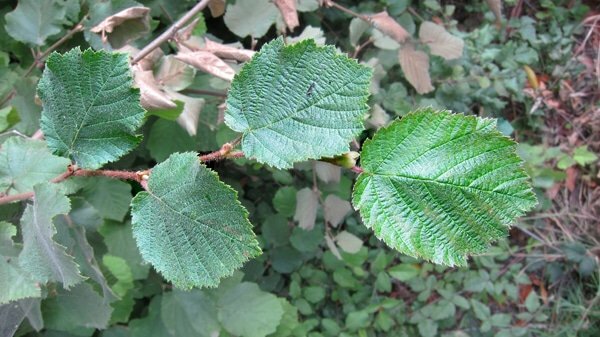 They have a pretty typical leaf pattern, but look for the toothed edges and the fact that hazel leaves are fuzzy. The leaves also alternate like you see in the picture. You may also see the male flowers, called catkins, on the plant as well. Incidentally, grouse and quail love to eat these. Start scoping out for unripe nuts around Independence Day. Start checking them toward the end of July and into August. You are looking for the nut sheath, called an involucre, to be mostly still green but with patches of color, ranging from rosy red to brown. Nothing else looks like a hazelnut, so there are no poisonous lookalikes to worry about. Typically beaked hazels set single nuts, but doubles are pretty common. I’ve found quite a few triples and a few quadruples. My friend Sam Thayer says he’s found up to nine nuts in one cluster! Pick the clusters by twisting them off. Don’t break the twigs. Now I ought to tell you that the involucres of beaked hazelnuts are covered in little fuzzy spines. They are not as bad as the hated glochids of prickly pears, but if you have soft hands you may want to wear gloves. I don’t, and yes, my hands bother me for a few minutes after I am done picking, but it goes away quickly. Once you get home with your hazelnuts, you need to let the involucres dry out. I put the nuts in a big hotel pan in my garage to dry. They key here is to spread the nuts out in a thin layer — I’d say no more than two nuts deep. If you stack them too deep the ones on the bottom won’t dry as well, and if you live in a place where it isn’t arid, as it is here in NorCal, they could rot on you. I left mine to dry for a couple weeks. This gives any nuts I might have picked too early a chance to ripen. Picking some nuts that are unripe is an occupational hazard, but if you wait until at least the end of July to pick (in California) you should be OK. You’ll know if the nut was unripe when it comes time to husk them: The husk sticks to the top of the nut. Does this mean you need to toss the nut? Nope. But eat those hazelnuts first, as they will not store as long. To husk the nuts, I just tear off the involucre with my hands. The hazelnut should roll right out. Yes, you will get the little pines all over your hands. Deal. Or wear gloves. There is no other good way to husk them in a dry climate. Sam, however, lives in Wisconsin. His technique will work if you live in a wet place: He buries his hazelnuts in mud for a month. When he digs them up again, the involucres are all black and rotted, but the nuts are just fine. 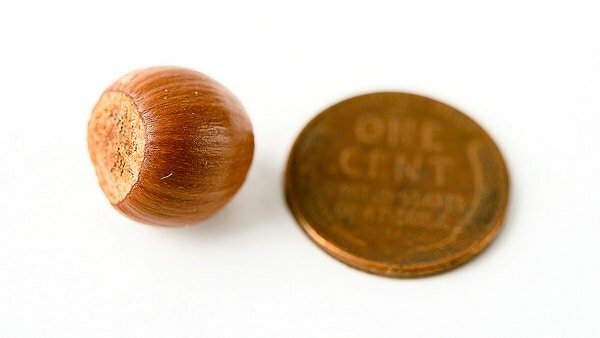 Keep in mind that wild hazelnuts aren’t as large as the domesticated filberts you buy in the store. Once they’ve been husked, hazelnuts last for a long, long time in the shell. I’ve eaten 18-month-old nuts that tasted fine. When you are ready to eat them, just crack and eat. Or if you want to roast them, crack and lay the nuts in a single layer on a baking sheet and bake at 275°F. for 15 to 20 minutes. Don’t let them scorch, so watch them after 10 minutes or so. If you want to remove their skins, wrap warm hazelnuts in a kitchen towel and let them sit for 10 minutes. Rub off the skins in the towel. 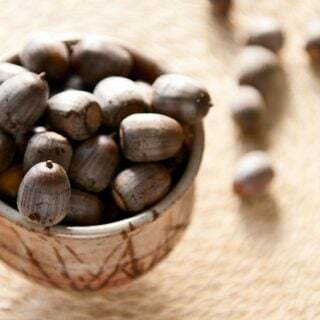 You’ll find lots more information about identifying, gathering, processing and eating wild nuts and other wild starchy things right here on Hunter Angler Gardener Cook! I just picked some for the first time. saw them last year but did not know what they were. Have been drying them in the sun and taking them in at night for a while. Rained a few days so kept them inside. Covered them with towels so the wild life mice, etc would not get to them. I think they will be ready soon. There is a much much better way to remove the husks. You get some sort of tough bag, burlap or a dog food bag or even a contractor trash bag. Make sure the husks are sufficiently dried, I put mine in the back of a car for a few days, then you put them in the bag and walk on them on a concrete floor with shoes. They pop out if the husks for the most part.